While there are those who disagree with the FSI on some issues, this study seems to be well done, with the factors well accounted for. This study is mostly in keeping with our real-world and training experience. While it is not gospel, and we do not follow this as a methodology, it is good that there are studies being performed and techniques analyzed on this understudied subject. On the day after Christmas a woman was fatally shot while shopping with her 2 year old son and her nieces when she left her handbag with a concealed handgun unattended. This tragedy, like many, was completely avoidable. While we are not trying to “armchair quarterback” this loss of life, we feel that some important lessons clearly need to be pointed out here. Our courses have always recommended against any method of carry that is off the body for a number of reasons including the ease of theft (one cut from behind through the purse strap and it’s gone),difficulty of access, and more. One of the key reasons for us is that by its nature, one must surrender immediate control of the weapon whether setting it down, hanging it in a restroom stall, or other similar reasons. From there it is a very short journey indeed to losing conscious control of the weapon through distraction or inattentiveness. Clearly being a “gun person” and regular trips to the range did not present her with this perspective. This is why we always recommend to our students to train in all facets of personal protection from first aid to self-defense, etc. Train in a wide variety of subjects from many instructors. As always our sympathies go out to the family and friends of the victim. Important notice for our readers who are USPSA shooters: The USPSA website was hacked and a list of emails and passwords published in the open. Whatever email address and password you used to login to USPSA is compromised, if you use that password anywhere else I’d recommend changing it immediately. There has been much buzz surrounding this tragic incident in Cleveland, OH, and frankly most of it ignores either the facts of the case or the realities of the situation. Let’s take a look at what happened. According to the AP, as found at Police One, the boy was waving around a gun and scaring people at a playground. The 911 caller said he did not know if it was real or not. The caller said he told dispatch he thought it was probably fake. Now considering how realistic many of these items are, SEE PHOTO HERE it makes me wonder on what basis the caller, who was at a distance, decided that this was “probably fake” other than his disbelief that a 12 year old boy could possibly be threatening people with a real gun. Most major cities are grappling with youth violence. Minneapolis started to deal with this as a “public health threat” when they realized that over 50% of their violent crime was committed by juveniles. See here and here. I recall an incident this spring where a 13 year old stabbed someone in the neck at a bus stop and nearly killed his robbery victim. In major cities, this is just the way things are. Now to address the officer’s response. As a firearms and permit to carry instructor, and court-approved expert witness I am quite aware of the realities of situations like these. As both a civilian and a Protective Agent, I have been in them myself. For those who are not familiar, the rules are rather basic. If you are confronted or confront someone, regardless of age, who has been threatening people with what is reported to be a firearm you had best be doing so with a firearm if one is available to you and you can get to it in time. When a command is given to someone at gunpoint to raise their hands, and they reach for a gun they are very likely to be shot. People are pointing out that the boy never pointed it at the officer. I do not know of any professional level training that tells you to wait until you are being shot at to defend yourself, and the difference between being shot at and pointing the gun is a matter of a fraction of a second. Another consideration that needs to be taken into account is the rather anemic performance of handguns when it comes to the time required to incapacitate a suspect. The magic one shot stops where the suspect instantly falls down incapable of action is strictly a creature of hollywood. 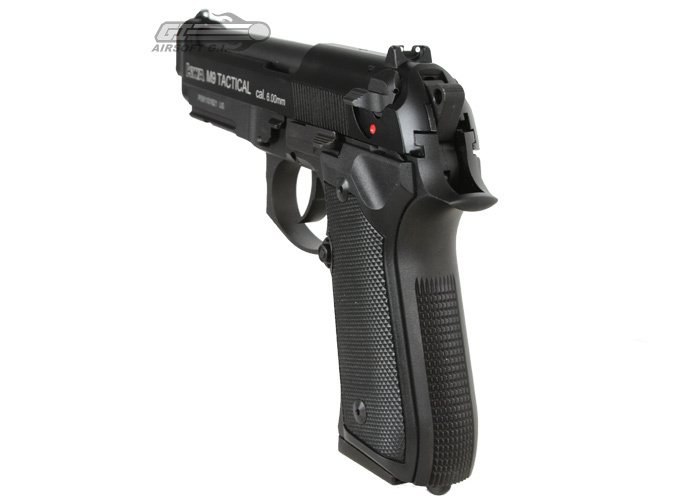 This is why, with handguns, shot placement and volume are the keys to survival. So when the officer responded, saw a gun on a table or bench, saw the suspect put it in his waistband and then confronted him there was no reason to believe this was anything other than a real firearm. Not only had the orange tip been altered or removed that would identify it as a replica, criminals have been known to paint real firearms to look like toys. He had also not been informed of the caller’s belief that he thought it fake. There are more things that we do not know about what happened in this case, but on the information available this sounds like a case of legitimate self-defense. Senior Judge Anthony W. Ishii, a Bill Clinton appointee, of the U.S. District Court for the Eastern District of California, ruled the 10-day waiting period violated the rights of those having already met the other standards of the laws of that state. “The 10-day waiting periods of Penal Code [sections 26815(a) and 27540(a)] violate the Second Amendment” as applied to members of certain classifications, like Silvester and Combs, and “burdens the Second Amendment rights of the Plaintiffs”, Said Judge Ishii. Those that have passed a background check and hold a license to carry a handgun, or who hold a “certificate of eligibility” and possess at least one other gun known to the state are no longer subject to the waiting period. While this is one small step in what is becoming a increasingly heated debate over the right to bear arms in this country, considering the state and the judge, one can look at this as a very positive sign that the rights of the people will not be as readily stripped as some would like to see. Buying himself time, he was able to grab his gun, hit the silent alarm, and then exchanged fire with the suspect. He fired 6 times, and it is believed that he hit the suspect 2 times. It was reported that the 6 shots were all fired within about 2 seconds. Despite purportedly hitting him twice, the suspect did get away and is still at large. This story is certainly nothing that we ever want to encounter first hand. It illustrates that what we teach in our course is a very good representation of just how fast these incidents go down and how they are nothing like you see in the movies. You’re almost never going to see the sights on your weapon, and might not even see the weapon in your hands. The so called “aiming to wing ’em” stuff that is espoused by so many, simply will not work. Frank McGee, former head of NYPD’s Firearms Training Unit, liked to say that any armed conflict (involving police, but certainly can be applied to civilians) usually followed the rule of threes; Three shots, three seconds, three yards. This incident went outside of that a bit, but not by much. Williams fired 6 shots in under 2 seconds, and was able to hit his target with two of those shots. The fact that he had his wits about him and was able to distract the suspect long enough to get his own weapon and fire, quite possibly saved his life. We have always taught that Time = Distance = Options. While distance probably didn’t apply as much here, he certainly bought himself some time, therefore presenting himself with an option that he didn’t have just seconds before. There is a reason that we teach what we teach, it works in the real world. It’s been proven in combat, it’s been proven in self defense situations, and it is, simply put, the most practical approach to self defense that we’ve seen. Leave the macho attitudes and tactics at the door. You should plan your self defense strategy using proven methods that will afford you every chance to stay out of harms way, allowing you to get home safely. Self defense is not static. You cannot plan a scenario for every altercation or event that might come up. Self defense is a very dynamic beast and thinking on your feet might just keep you out of danger in the first place, or like Mr. Williams here, give you a fighting chance if conflict is unavoidable. Another huge blow for Kalashnikov enthusiasts. Tonight, as I sit at my computer, checking various links and Facebook as I do, I came across something that troubled me greatly. As I tried to source it, tried to find other stories backing it up, it seemed more and more likely to be true, as the minutes flew by. It appears that another nail in the coffin of the Second Amendment is being hammered in as we speak. When I saw this, it hit me a like a ton of bricks. The link for today’s entry to the page is located here, with additional links to the FAQ and others previously added to the SSI List. What this means for any of you who may own an AK, or who aspires to, is that no entity based in the US can enter into any more business dealings with Kalashnikov Concern or Izhmash, one of the biggest AK manufacturers of AKs and accessories on the planet. To give you an idea of what this covers, no longer will VEPR, Saiga, or any others marked Izhmash, be able to be imported into the US if Izhmash has any stake in the importation whatsoever. This all dates back to an Executive Order (13662, found here) signed by Obama on March 20th of this year, as a result of the situation in Ukraine. This only further builds upon that by bolstering the sanctions against even more entities, this time the famous manufacturer. When is enough, enough? When will we wake up and realize that none of these measures are taken for our safety? We are simply pawns in a political game much bigger than you or I, and I for one hate feeling like I don’t have a say in where we’re moved on the board. I’m not just talking about our gun rights either, although it seems like they have been under assault more than any other lately (with the exception of maybe our rights guaranteed by the 4th Amendment). This is just another huge blow for AK enthusiasts, coming right up on the heels of the BATFE ban on the importation of 5.45 caliber 7N6 ammunition used in the AK74. In another horrifying incident, a man with a violent background executes 6 of a family of 7, the seventh being wounded and playing dead. Four young children, and the parents died, leaving only a 15 year old girl as the survivor. The suspect was looking for his estranged wife, and apparently bound and questioned each victim about her location and then executed them. This was not limited to this incident, as he was charged with assaulting his own mother last week in San Diego County in a similar fashion, according to KPRC court documents allege he duct taped her, questioned her about his estranged wife’s location and then assaulted her. Minnesota crime statistics are clear, the VAST majority of homicide victims knew their attacker. We can infer that is it likely similar in other states. The failure of the system to protect is evident here. While is is lunacy to expect police to protect you from any particular random incident of violence, this was the one year anniversary of the restraining order that his wife had granted against him. So, there was a violent criminal offense in 2008 which the justice system ignored, a restraining order a year ago, and he assaulted his OWN MOTHER last week, but no one saw fit to keep this (suspected) clearly violent person off the streets? Yes, this is clearly a gun issue as we know it will be made out to be. And this terrible tragedy was not worse thanks to the survivor who managed to inform police that her attacker was headed to another relatives house in time to get a plainclothes officer there to evacuate the targets and arrest the suspect after a several hour standoff. After being shot in the head. We firmly believe the term hero is far overused. This, on the other hand is what one is. Despite likely fearing her own death, her only actions were in defense of others. We rarely if ever post about fund raising efforts, as we prefer to remain neutral on most issues, but if you are so inclined, the links to do so are on the news sites we linked. As always, our hearts go out to the countless people affected by this act. May God have mercy on their souls. So over the last week or so, the Liberty loving staff at Pistolcraft have been involved in a rather heated debate with the local “gun-rights” group here in the once great state of Minnesota. 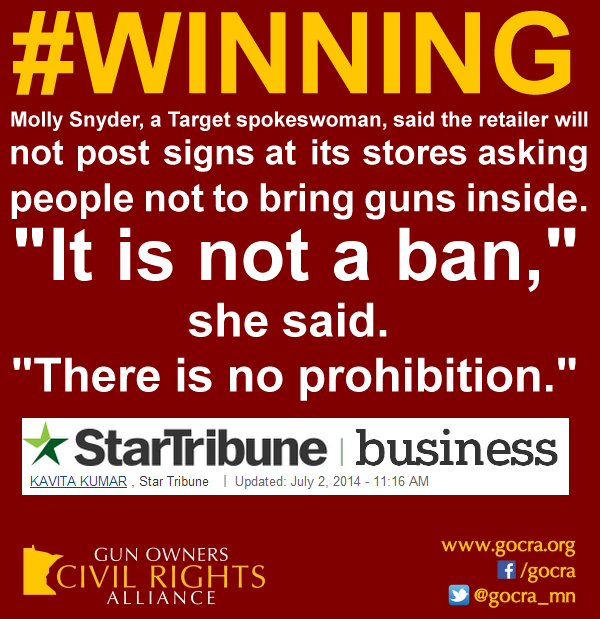 When the head of Target issued a letter under pressure from an anti-gun group to ban guns in its stores, Target took what may (from a corporate perspective) have been the best path it could under the conditions. It issued a letter requesting no firearms be brought onto its property. Considering that the gun rights crowd has not been putting together the necessary social and financial pressure to combat the opposition’s current strategy, they took the middle of the road approach hoping to appease both sides enough to not damage the bottom line, which is the job of a business. It is up to us to take the requisite action to convince them of the wisdom (or lack thereof) of such policies. The traditional methods are still the best. Phone calls beat emails hands down. Boycotting and stripping them of revenue to show them that this policy WILL effect the bottom line is now necessary in our opinion, as the letter has been made public. And, as expected by many of those following this issue, much like Jack in the Box, the armed robberies of customers have begun. A story published yesterday details several armed robberies in Georiga. There will be others. We had the same experiences in many states with smaller businesses that posted signs and got robbed. When the signs came down, most of the robberies stopped. We here at Pistolcraft see the damage that incrementalism has done in the world of civil rights over the course of American history, and this is no different. If we allow even an inch, they will eventually take that mile. Bloomberg and his crowd are trumpeting these victories far and wide, and the media is proud to aid them. Make no mistake about it, when they get enough of these ‘requests’ granted, they will move for outright bans in private establishments, and then for other restrictions on carry in public venues. 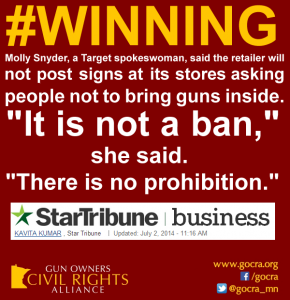 What does GOCRA, the local “gun rights” group have to say about Target issuing this letter? They call it a “win”. We see this as anything but a win. It is long past time for those who love Liberty to stop compromising, and not give any more ground in what is a multi-faceted battle for the rights so many fought and died to ensure to us (many other freedoms are also under constant attack). We have written previously about this happening with other major chains, and the trend is increasing. Now Target is added to the list of Starbucks, Chilis, Jack-In-The-Box, Chipotle, and likely others that do not want the business of law abiding armed citizens. We say abide by their private property rights, and boycott them. Let them know you are doing it. We will soon be creating a series of pages on our site detailing those that stand opposed to your choice to be armed, and contact info along with form letters to use in contacting them detailing your respect for their private property rights. To those who oppose our rights to self-protection, we stand fast against you. We will fight you to the last. To those who cower alongside them, seek not our business or our support.